Home Lifestyle	Why Didn’t I think of That? You can file this right into the DUH folder. I feel so silly that I haven’t ever thought of this that I had to out my stupidity to the world. Perhaps a stray reader here and there will share in my shame 🙂 It’s kind of like the time I found out there are tabs in the tin foil box to keep the roll from FLYING out every time you want a sheet. You know, RIGHT there on every single box, for my entire life! Many of us are trying to save money here and there. One way Jerry and I do this is to buy chicken breasts in bulk. I usually get boneless/skinless but this week there was a great deal on bone-in chicken breasts (88cents/lb) so I got some! In the past I have just cooked them with the bones but I just don’t like doing it that way. When I came across this post on $5 dinners today, the light bulb came on! And it wasn’t even about de-boning the chicken. It was about pre-marinating! Yes! So, I cut all the bones out of the chicken and separated the breasts into freezer bags…..wait for it…….WITH the marinade and put them in the freezer! Now all I have to do is thaw and cook! 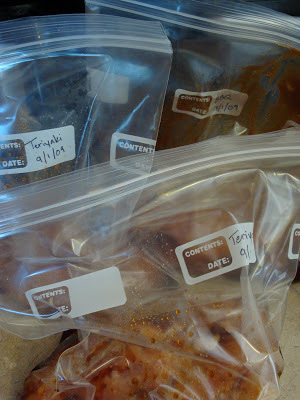 No more waiting for meat to thaw, then waiting to marinate (or skipping that entirely). Seriously, why has this never occurred to me before??? I also followed her advice to make my own chicken broth by slow-cooking the bones with some vinegar, garlic and Italian spices! I feel like a regular Betty Crocker over here ya’ll! **Update – I got 7.5 cups of broth! Woohoo! I used to always do this…until Greg got so tired of chicken that he complained about it. I love it though. This and the crock pot…makes life much easier! I had no idea that foil has some magical tab to keep it in the box. Thanks dude!